Your physique is out of this world, your tan’s flawless, and your suit couldn’t fit better. You’ve got your walk and poses down pat, you know what you’re doing with your hair…the last piece of the puzzle, the only one missing, is MAKEUP! Never been much of a girlie-girl? Well, it’s time to dial it up and get that face on! Here’s how to do it right for stage. Your body’s nice and tan, but your face is quite a few shades lighter; if you want any chance at looking glam, you’ve got to get those colors to match! MAC’s Studio Tech in NW45 and NC45 (depending on your natural skin color), ERA Spray-on Foundation’s R8, and Cinema Secrets cream foundation in dark palette will all provide good coverage, perfect your complexion, and make you look like your face belongs on your body again. They all work well with both Protan and Jan Tana, though Jan Tana does make their very own cream foundation. It provides great coverage and a perfect color match, though it isn’t as easy to blend as some of your other options, so be sure to practice application if you do decide to go with this choice. Begin with your normal face care (toner, moisturizer, so forth). Then, depending on the foundation you’re using, use either the provided applicator sponge (as with Studio Tech), or your fingers (any cream foundation will work best this way) to glide the color onto your skin evenly. Blend well without applying too much pressure, as that’s what will create those dark spots we’ve all seen competitors sporting! Take your time, and apply your foundation not only over your face, but over your jawline, ears, and blend well around the hairline and brows. Again, blend well! Once you’ve achieved an even complexion, use a slightly moistened cosmetic sponge to blend everything out even further. Even if you never wear foundation in your every day life, you’ll want to add some color to your face for the stage. Now, don’t forget, you’ll look washed out if you don’t wear brighter colors, so while you don’t want any neon pinks, you do want a pretty pink highlighting the apple of your cheek and a nice, peachy, darker bronze color right beneath your cheekbones. Even if you feel like you’re wearing a whole lot of makeup, as long as you don’t look like a clown, you’ll probably be good to go. 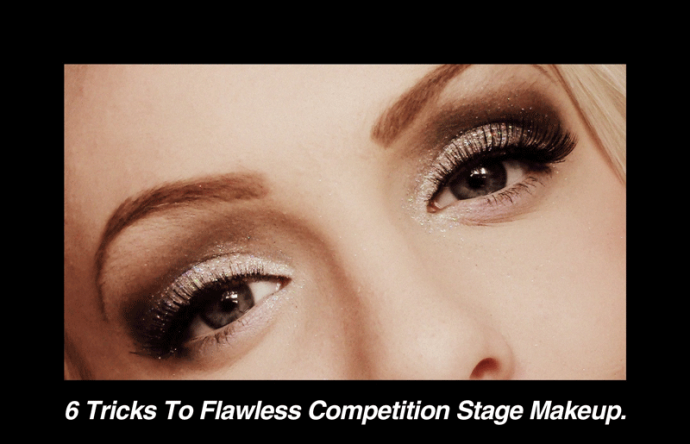 In fact, you want to look a bit too intense or “unnatural” in daylight in order to look really good on stage. You’ll want to create a smokey, well defined eye makeup look, and shadow is a big part of that. You’ll want to use a few different colors, ranging from pale to dark, layering them on top of one another (please don’t skip the layering steps, as it’ll look patchy, not smooth with dark shadow). Using a crease-proof base may be a good idea, but if you don’t have one, just put a bit of foundation on your lids, follow that with a layer of light brown foundation across your entire lid. Apply a darker color (either a neutral dark brown or gray, or a dark color matching your suit) from your lash line up to your crease, blending out as you come up from the lash line. Now, don’t forget, even if you do decide to go with a color that matches your suit, choose one that compliments it if your suit is a brighter color. Last thing you wanna sport is neon green lids! Next, you’ll want to grab a slim brown or pencil brush, dip it in the darkest of your black shadows, and run it right over your lash line, carefully blending it right into your lashes, and winging it out a bit toward the outside of your eye. Take a slightly lighter neutral shade and sweep it right into your crease, out toward the winged-out lash line you’ve just applied. 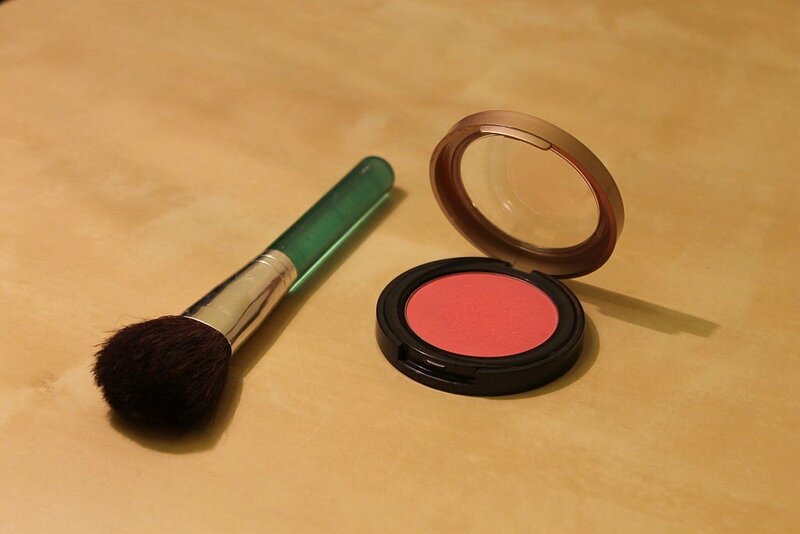 Blend it all together so it doesn’t look blotchy; apply layers of color as necessary to make your eyes pop. Now that you’ve got the lid covered, you’ll want to line your eyes right along the lash line. You can never go wrong with a black pencil or liquid liner, but if you don’t feel confident using those, you can always dip a liner brush into water, then some dark shadow and carefully apply right over your lash line. Extend the ends of this line out and slightly upward on the outside of the eye, and don’t take the line too far inward on the inner side of the eye, as this’ll create the appearance of close-set eyes. While lining your lower lash line is generally a good idea, do this with a lighter hand; you don’t want to look like a raccoon, and you will if you overdo it on the bottom of the eye. Make sure this line is very slim and placed right over the lash line. Before you move on to the lashes, grab a highlighter color (a very light shadow with a bit of shimmer, and sweep this color right over your brow bones. 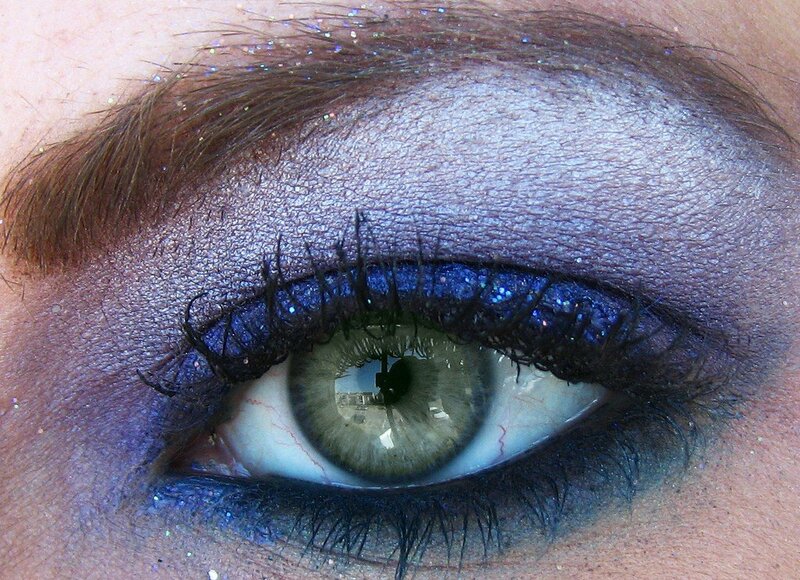 Add a bit of shimmery white shadow into the inner corners of your eyes, which will really make your eyes sparkle! If your lashes are naturally long and thick, you may get away with curling them and applying a couple of coats of mascara. Generally, however, it’s a better idea to apply some false lashes. Those will show up better in photos, and they won’t be too much of a hassle to apply if you practice a few times before your show day. 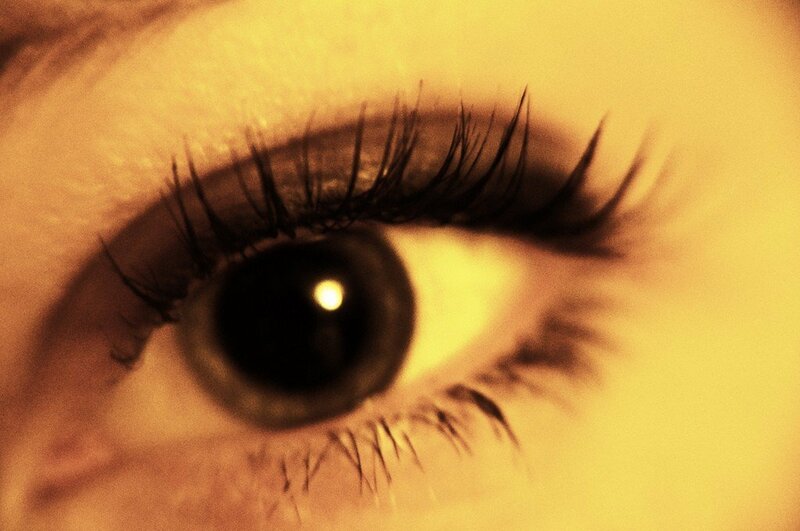 Curl your natural lashes, but don’t apply mascara. Pick up the falsies with a pair of tweezers, apply a very thin line of glue along the lash band with a toothpick, and let it dry slightly so it begins to get tacky (about 20 seconds or so). 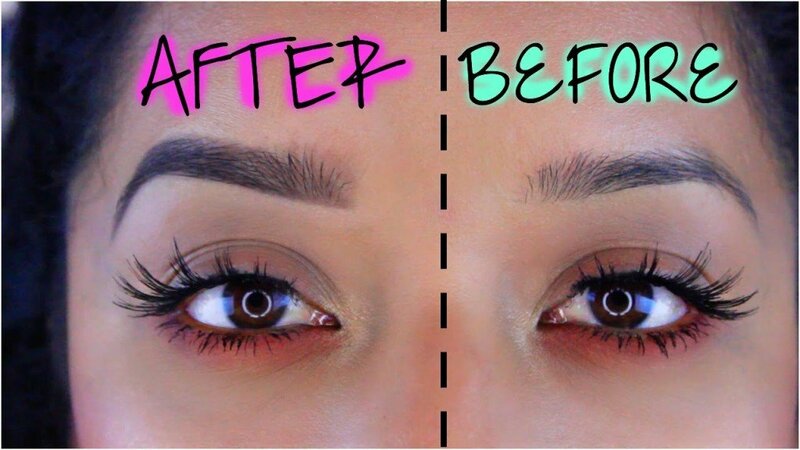 Now slightly lower the eyelid of the eye you’re applying the lash to, and line up the false lash with the your natural lash line, from above. Once lined up, push the lash onto your lid with the tweezers (right above your lash line, not over it! ), starting from the center. Do the same on either end until the entire lid is securely in place. If you’re happy with how the lash lined up, wait a minute for the glue to dry, and adjust the tips of the lashes as necessary, applying mascara if necessary. If you’d like to reapply, just take the lash off before the glue dries, and go for it again (you may need to reapply the glue, but make sure you don’t end up with too much of it, as it just won’t get tacky enough to work). So, your eyes are looking amazing, as is your skin. Let’s move on to those brows. If you’re a blonde or have dainty brows naturally, they’ll disappear on stage, and that’s not attractive on anyone, so even if you don’t normally fill in your brows, you may consider doing so for your show. You’ll generally not want to fill in your eyebrows with a color that’s too far off from your natural hair color, so if you’re a blond, you’ll want to go with a light brown pencil or powder for your brows. Got dark hair? Go with a dark brown for the eyebrows. And if your hair’s black, grab a black powder for those brows. I generally prefer the look of powder-filled brows to pencil-drawn ones, as the latter seem to appear more natural. You’ll want to fill in any sparse areas and generally give your eyebrows a nice shape; just don’t make them unnaturally thick, either. Sticking to your natural shape is usually a good guideline. It may be your natural instinct to go for the darkest lipstick you can find, but doing so is not the best decision you can make. A dark neutral will usually blend right in with your newly dark skin tone, making your lips disappear. Brighter reds, pinks, mauves, and peaches are a better bet. You can use a color from the family you’d use on a regular basis, but a more intense version of it. If you generally don’t wear lipstick, going with a pretty pink color will probably feel most comfortable to you. Apply your lip color starting with a pencil or a marker, filling in your entire lip, starting with the outline and inward. This will make your lipstick last a whole lot longer, not to mention the fact that you’ll avoid that dreaded 80s lip outline look as your lipstick starts to wear off! Once you’ve applied your pencil, go in with a layer of lipstick over it. This is best applied with a brush or your fingers rather than straight from the tube; it’ll blend better this way, look prettier, and stay put much longer. Top off with a bit of gloss (not a whole lot, and the tackier, the better, because that’s the kind that stays). You’re looking fierce and fabulous. Go get ’em, girl!